This bot wants to remove human error from cataract surgery. Medical robots are increasingly being adopted in hospitals all around the world for a number of uses, including diagnostics, testing, and treatment. Due to their precision, they are proving particularly useful for surgery, and now another robot has been built to undertake a delicate operation: cataract surgery. Cataract surgery is rather simple in concept, but incredibly delicate in reality. To do one, a surgeon must cut a small hole in the eye’s lens, remove the cloudy part that’s fogging up the patient’s vision, and replace it with a small piece of plastic similar to a permanent contact lens. The thin membranes of the eye are pretty sensitive, so the most likely complication from this surgery is that a surgeon pierces the back of the lens, causing hazy vision. To counter this issue, Cambridge Consultants has created Axsis, a two-armed, teleoperated robot that can operate on eyes with more accuracy than a human surgeon. The robot has two pincers that can precisely move in a 10 millimeter (.4 inch) space, about the size of an eye lens. The surgeon controls the robot using two joysticks and an enlarged image on a screen. The size of the latter allows the surgeon to move the robot exactly where he wants it to go to perform the operation. Robots have been in the operating room for some time now and with increasing frequency. 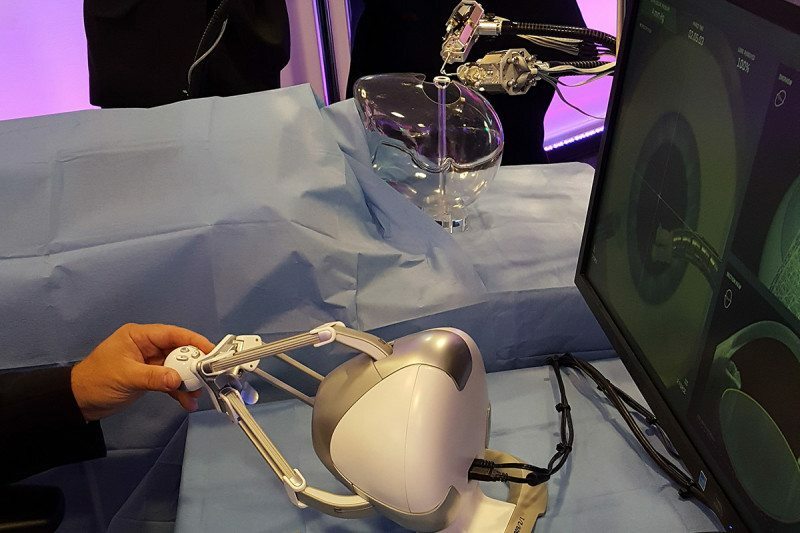 Popular surgical robot da Vinci was able to perform nearly half a million minimally intrusive operations in the US just last year, and other surgical robots have been used in operations to treat lung problems, appendix problems, and many others. In development are small microbots that operate inside the body to perform surgery, and still other robots are operating on eyes, just like Axsis. While some aren’t sure what need Axsis has filled as lasers eliminate much of the risk involved with cataract surgery, the system could lead to other operations that require small, delicate movements. We’ll have to wait to see what Axsis gets its robot hands on in the future.